Equal Pay Day stands for the gender pay gap between women and men, which according to the Federal Statistical Office is 21 percent in Germany. This large pay gap means that women work for free until 18 March, i.e. 77 days, while men have been paid for their work since 1 January. Thus, the gross hourly wage for men is 4.41 euros more than for women. Germany lies thereby in the European comparison far behind. Positive examples in Europe are Romania, Italy and Belgium, which have gender pay gaps of less than 7 percent. CAJ women see a huge problem here and do not want to accept this: Jasmin is angry when someone says that the pay gap doesn't even exist if more women work full-time or if they go less into social professions. She wonders why it is still the case that social activities are so badly paid. Lisa sees the gender pay gap in unpaid jobs as a huge problem. "How can it be that women in the same job earn less than their male colleagues? Jasmin takes Equal Pay Day this year as an opportunity to investigate how much her colleagues* earn. "Do you know how much your colleagues earn? Have you ever asked, have you received an honest answer? Caro says: "It's a scandal that we have to talk about women being paid equally. That should be self-evident. And that is why we have to fight more than ever! Christoph is fighting for Equal Pay Day because it is time that we finally abolish patriarchy. 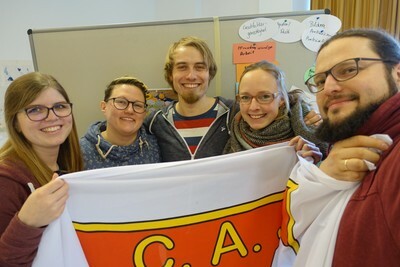 We as CAJ Germany stand for equal rights, equal opportunities and fair wages - regardless of gender. We demand the abolition of the gender pay gap!